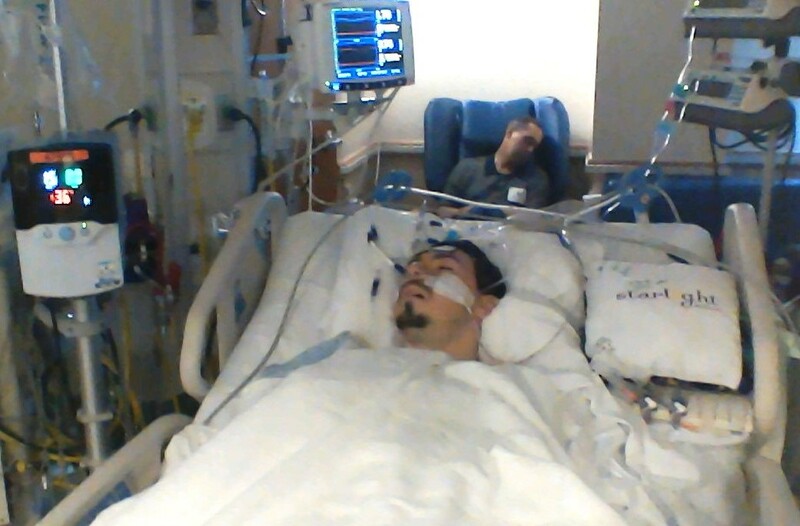 Jeff dozes as Matt recovers in the ICU after his fifth open heart surgery, April 2014. My screen captured this peaceful moment, a respite amid two intense weeks in the hospital. Reading Mukherjee’s impressive history of cancer treatment has made me even more aware of how much we owe to earlier generations of patients. These pioneers endured extreme discomfort, agony and even death from experimental treatments. Their determination and courage enabled the medical advances that save so many of our lives today. As in every other area of life, we benefit from the sacrifices of thousands of people whose names we will never know. Illness takes no holidays, and medical crises have no predictable calendar. We all know people who are dealing with serious illness this season, unable to enjoy the festive cheer with the lightheartedness that is possible for those of us in good health. I hope we will remember these friends in some way. A personal note, a heartfelt prayer, a visit or call or small gift; any gesture that will acknowledge their trials, and let them know they are not forgotten in the rush of December. One of the best ways to defeat despair is to brighten someone else’s day, especially this time of year. When my brother-in-law was diagnosed with a rare form of terminal cancer he agreed to participate in a number of medical trials. It’s good to think that this is one of his legacies. Yes, a bittersweet legacy, but an important one. I’ll never, ever forget that line in the movie “Lorenzo’s Oil” when the tearful father says to the tearful mother something along the lines of “Did it ever occur to you that we did all this for someone else’s child?” At the 2009 Health Care Summit, one of my fellow attendees became a friend and correspondent, and I later learned that his son had been one of the first to undergo the type of heart surgery that had saved Matt’s life a few years later — same hospital, same surgeon, small world. Best of all, his adult son is still alive, healthy and doing well. Some endings are happier than others, but we owe so much to the ones who had the courage to face those devastating odds. I think they did — I think I was just FAR too late getting to them! Check and let me know if any are missing. My apologies for the delay! You guys have really been through it. It’s sometimes a wonder how much a person must endure and it’s wonderful that you continue to see the good that comes from all the adversity. There always is something to be gain but it’s hard to focus on it when loved ones are suffering. Thanks for the reminder to pay attention to others going through a tough time. Hope all is well for the moment. Giant hugs. That photo, Julia, so personal and powerful. Thank you, Alys. The scene struck me that way when I looked up and saw it in real time, and that’s why I had to turn my computer around on my lap and snap a memory of it. You, my dear Julia, are the witness to 2 men who show “substantive heroism” everyday after what they have lived through! The same can be said of you as the diligent care-giver always on top of the issues during their particular procedure or hospitalization! I have the privilege this year of making a quilt for a 90 year old woman who lives alone. My grandchildren’s 4th grade teacher reaches out to people who do not have family to care for them. I have enjoyed working with her class, tutoring writing skills & reading for many years. This is a blessing to me to help add cheer to this lady. Thanks for encouraging us to reach out to others! Mary Ann, how wonderful to have that lady in your grandchildren’s lives, and in yours too! Not to mention the people to whom she reaches out in love. I don’t feel heroic at all tonight so I appreciate your kind words. For now, I’m just trying to channel the quote I featured in this post. Thanks for being here to greet me tonight! Mary Ann, the heart came through! Literally and figuratively! Oh Julia, I wish I could wrap you in a big hug and then help to ease your burden. Know that I am with you, my friend, and with Jeff, too. Thank you LB! Sometimes cyber hugs are the best kind! Not dependent on proximity or the clock or time zone! K, no need to apologize; no one has been more absent lately than I have, and not just online, but elsewhere. You are wrestling with an age old question that troubles many of us, but I get past it by remembering that I never know the whole story; not the past, nor the future, nor even all of the present. I don’t know what it might be like in some people’s worlds, but I’m convinced that many people who are cruel or evil or just obnoxious are living in their own private hells, and if knew what they endured, my anger might be overcome with sympathy. I believe life is a great equalizer, and I do believe that justice and mercy go hand in hand. It’s easy to want mercy for myself and justice (in other words, punishment) for “bad” people, 😀 but everyone in the world is in need of both so I try to keep that in mind. Some days I do better at it than others! Hee-hee, I can just picture you as the replacement for Judge Judy. “Judge Boomdee — as in LOWERING THE BOOM!” Ha! But really you don’t fool me. I think you are a softie. * Although I agree you are onto something when you say that it’s best not to waste too much mental energy on the bad guys. Sometimes these types are after any sort of attention they can get, and some really disturbed people go for the ultimate in negative publicity. That’s one thing that bugs me about the media turning violence into 5000-10,000 headlines and stories per incident (or at least it seems that way). I’m always afraid there will be copycats and others who exploit someone else’s tragedy. I would rather see celebrations of the countless acts of courage and compassion that still outnumber the bad ones. *but just to hedge my bets, remind me to have my lawyer veto you if I’m ever on trial and you are up for jury duty. I have actually never seen Judge Judy except on brief sound bites, but I like what I’ve seen of her. And yes, it is terribly sad that so many people (of both sexes) are willing to take so much abuse in order to stay in relationships that are so one-sided. Re: the news, your stations sound more like our PBS, which is far and away the most quiet option we have. But increasingly, I’d rather read the news and/or opinion pieces online; it’s so much easier to select quickly that way, and avoid the idle chatter and commercials. Re: jury duty, no, I’ve never been, although a part of me would find it interesting but also pretty boring, I’m guessing. I’m not sure I could survive any of the pre-selection process, though, since I tend to be outspoken about what I think, particularly as regards the law. While we lived in CA, I got called for jury duty all the time, but always had to be excused because the hours required did not line up with the times I had to be home for Matt (he typically was only away 5 or 6 hours per day). Here in Virginia, same situation, but I’ve only been called once. My sister (in Alabama) was on the jury in one of those high profile, change-of-venue trials many years ago, and she had to be sequestered in a hotel for the duration. I would HATE that, I think. My undergrad degree was in Political Science/Communications which was a pre-law type field, and in one of my classes, we had to serve as the jury for the Moot Court at Vanderbilt’s law school. I thought that would be great fun, but it was an agonizing bore (especially since we were doing civil law, not criminal). In fact, that experience convinced me that law school wasn’t for me. At least that’s my story — in reality I think it had more to do with being so ga-ga over Jeff that I barely managed to finish my last quarter of school and could never have done well enough on the LSAT to have gotten into any good law school, let alone survived the first year. But it sounds much better to blame it on Vandy’s moot court, Hee-hee. What’s wrong with me? I here of illness and witness the passing of children from cancer and do you know what I’m secretly thinking? I’m jealous, envious that it’s not me dying. I just had another VA shrink evaluation with a clean bill of health. I fooled another one. Bob, I don’t think you have anything wrong with you that many others do not share. Life can be difficult and almost unbearable at times. The past three years, though, have effectively demonstrated to me indelible reasons why NEVER to envy anyone with cancer. Yet even so, all difficulties (including cancer) carry redeeming graces. I once said, only half joking, that the great thing about having ever been suicidal is that it cures the fear of death. As we grow older and learn more and more about things we don’t particularly want to know, I think it’s natural to dread death less, particularly when so many whom we love have gone on before us. I love the song “Don’t Fear the Reaper” by Blue Oyster Cult. Some think it’s about suicide, but I have never heard it that way. To me it’s just an honest look at the common fate that awaits us all. Having said all that — I encourage you to find a doctor or therapist that you feel safe NOT fooling. I believe that there is very real help for people suffering from depression, but it’s not a one-size-fits-all picture and it may take time for each person to find the support they need to enjoy life as we were meant to do. Even when we can make it independently, it can help tremendously to have support. Different people find different forms of therapy — counseling, medication, faith, exercise, writing, riding, walking, on and on the list could go. I hope and pray you will be encouraged through the low points to savor and enjoy your life. So many might feel lucky beyond measure to walk in your shoes. I have to remind myself of that quite often. Bob and Julia, thank you for sharing your honest conversation. I understand. When Julia mentioned BOC’s “Don’t Fear the Reaper,” I remembered a discussion that I’d had with my son when he was a teen, that as Christians, we are blessed in that we don’t have to fear “the reaper” because we have such a hope for future joy. Thank you again for sharing this, because as Christians, we are also called to not just await the reaper (although it’s tempting to do), but to do what we can to make ourselves emotionally healthy, for the sake of the world in which we serve our Lord. Julia, I’m currently reading “Tuesdays with Morrie” by Mitch Albom. Susan, I did read that book many years ago, but I’ve forgotten most of it, though I do remember it was touching and definitely worth the time to read. It was a huge best-seller, I think. I have read some of Mitch Albom’s essays since then. He’s a good writer. Especially in pursuit of mental health. Especially in pursuit of spiritual well-being. Especially in living life on life's terms. Harry, thanks for that reminder. I really believe in being honest, but there have been many times when I had to wonder whether my own honesty has worked against me. I’m not talking about saying mean things to others in the guise of “being honest” but rather, refusing to play the mind games that seem to be so intrinsic to so much in our society. It’s hard to avoid feeling like a chump when the honesty isn’t reciprocated, whether by a business, government agency or person. That said, I do know in my heart that what you say here is true. I appreciate your affirmation. What a peaceful picture! Thanks for the reminder, Julia. During such seasons we only think of our joys, our celebrations. Instead of spending all our time at churches or parties it would be a great if we could spend a few moments with those who are unable to join the moments of fun due to their illnesses. Bindu, I heartily agree! When I was a little girl, our Sunday School classes used to go to nursing homes and take treats to the residents there. I think we enjoyed it almost as much as they did. Sometimes the joy we are seeking can be found in the most unlikely places. Best wishes to you and your family for a happy December! Sending so much love your way. What an outpouring this blog brings and inspires in others. You’re amazing, as always, now more than ever. Ellis, how wonderful it has been to have you cheering me on all these years, even when there was very little to cheer about. When your book first came out, I tucked the watercolor Christmas card you created for me way back in 1975 inside my copy of the book, along with one of your poems, and every time I open it I see again those reminders of our remarkable, decades-old friendship. Thanks so much for your steadfast support and love. Wishing you and Larry much joy in 2016! PS. not sure why or how I dropped off your subscription list, just resubscribed!! !